Can technology resurrect the I/O? 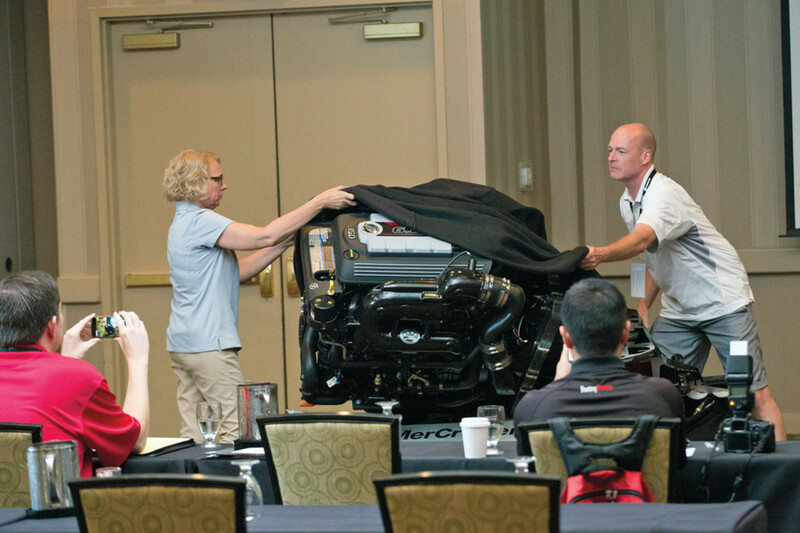 MerCruiser’s 6.2L V-8 sterndrive had a grand unveiling at a recent media event in Charlotte, N.C. Despite the gasoline sterndrive’s waning sales numbers, two of the industry’s leading engine makers have stepped up their post-recession development of improved I/O power packages. Competition between Mercury and Volvo Penta is heating up. 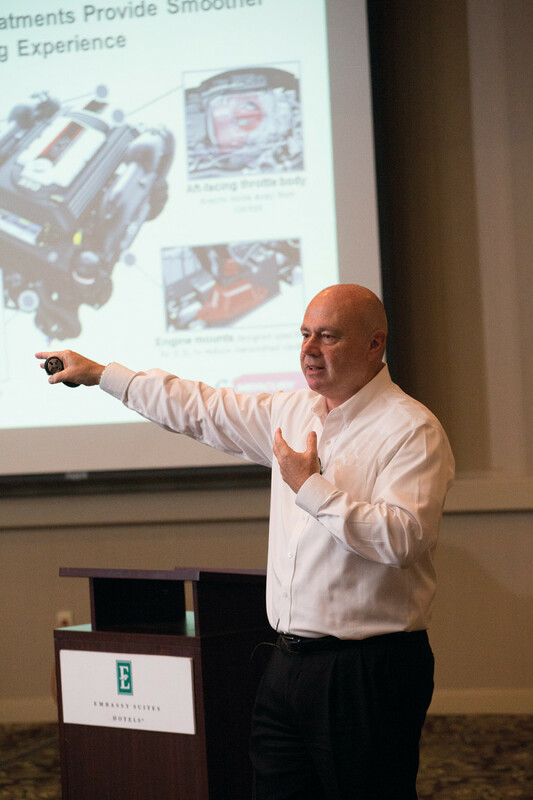 But since 2011, sterndrive boat sales in the United States have dropped nearly 5,000 units (from 17,500 to 13,000), according to Jack Ellis, managing director at Info-Link Technologies. The numbers indicate that “outboard power is king these days,” he says. But the weak state of the market has not stopped the research, development and introduction of new I/Os. Mercury rolled out its first in-house-built engine about a year ago — the 4.5L 250-hp MerCruiser. Previously Mercury used General Motors blocks to build its marine gasoline engines. Volvo Penta has stuck with General Motors, introducing the first of a fleet of sterndrives with the fifth generation of GM motors. The first engines — 200- and 240-hp V-6s with a 4.3-liter displacement — were introduced at the 2015 Miami International Boat Show, and they hit the market earlier this year. Volvo Penta will add to its Gen V fleet when it debuts three sterndrives at the Sept. 15-17 International BoatBuilders’ Exhibition & Conference: a 280-hp V-6 4.3L and two new 5.3L V-8s — 300 hp and 350 hp. The Swedish engine maker, which operates out of a U.S. headquarters in Chesapeake, Va., plans to have a full family of the next-generation gasoline engines by 2016. Volvo Penta followed up the 4.3-liter engine debut at the Miami show with its Forward Drive system for gas sterndrives. The drive, with its twin forward-facing propellers, resembles the Volvo Penta IPS — a diesel application — and can be paired with all of Volvo Penta’s V-8 gasoline sterndrive engines from 300 to 430 hp. The technology is aimed at the watersport boat markets, particularly boats used for wake surfing, which has been growing in popularity. Mercury vice president of product development, engineering and racing David Foulkes explained the technological advances in the new power plant. I got a chance to get on the water and demo Mercury’s new MerCruiser 6.2L sterndrive at the Charlotte media event. The in-water portion was held on nearby Lake Wylie in Clover, S.C. Mercury powered 10 boats from 21 to 31 feet with its propulsion and controls. Most, of course, were rigged with the new 6.2L engine; there were three boats with outboards, however, including a 29-foot racing catamaran with twin R400 4-strokes that blasted across the lake (with me in the companion seat) at 103 mph. The 380-cubic-inch 6.2L is packed with improvements that heighten performance, compared with the previous 6.2L engine (the 350 Mag and 370 Mag), Foulkes says. The new engine is more fuel-efficient, faster and quieter than its predecessor, he says. It does a better job of capturing air with its redesigned air induction system with “long-runner scroll air intake technology,” Foulkes says. Mercury has reduced engine friction with lighter pistons and rods and other internal material upgrades, he adds. Mercury also used the event to announce a new technology that automatically adjusts trim, based on the boat’s speed. Five of the boats were equipped with the system, called Active Trim Control. Coupled with Mercury’s Adaptive Speed Control technology, which holds engine rpm steady during turns and changing sea conditions, the boats illustrate the engine maker’s commitment to make boating easier, Foulkes says. “It’s another step toward making boating less stressful and more enjoyable,” he says. Simplifying boat ownership and operation has been a top priority for the industry during the past decade, and it now seems to be coming to fruition through engine technology and improved boat-control systems. I piloted three boats with Active Trim Control — a 31-foot Formula sportboat, a 25-foot Stingray bowrider and a 27-foot Shearwater center console. The Shearwater was powered with the new Mercury 350 Verado; the new 6.2-liter sterndrive propelled the Stingray (single) and Formula (twins). I watched the trim meter’s needle rise after the Formula planed off and continued to accelerate. Active Trim Control, which uses a Mercury-patented GPS integrated into the propulsion system, began trimming out the drive at about 30 mph, gradually increasing trim until the boat was doing 50-plus mph. Mercury also introduced its new Active Trim system at the media event, which automatically adjusts trim based on the boat’s speed. The drives tucked in when I slowed and threw the Formula into a few high-speed turns. Simultaneously, the Adaptive Speed Control held her at 3,500 rpm. Yes, these advancements make boating easier, and they’re fun to operate. But they also heighten safety. Active Trim Control and Adaptive Speed Control allow drivers to pay more attention to the water in front of them. In short, you can cut down on the number of times that you look down at the gauges. 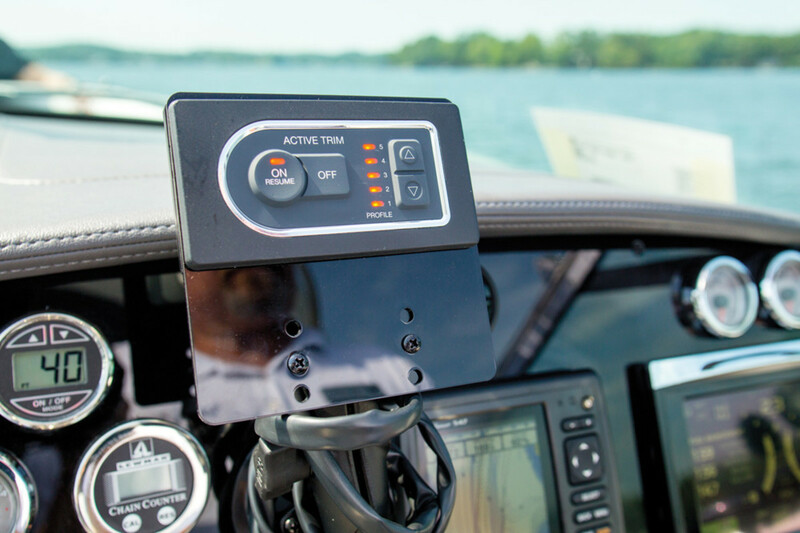 Tests on a range of boats show fuel savings of 14 to 54 percent by running in the Active Trim Control’s auto mode versus operation in trimmed-down mode, says Mercury communications director Steve Fleming. Five trim profiles are geared toward different boat types, such as runabouts, pontoons, bass boats and high-performance boats, he says. The system works with Mercury outboards from 40 to 400 hp and MerCruiser sterndrives from 130 to 430 hp that are compatible with Mercury’s SmartCraft dating from the 2004 model year. The Shearwater, with its outboard, was even more of a kick to drive than the Formula because I could look aft and watch the powerhead rise while the system trimmed out the drive as it powered toward its WOT speed. This high-end center console topped out at about 60 mph. Demo rides aboard a DCB M29 catamaran with twin Mercury R400s hit speeds of more than 100 mph. That’s nothing compared with the DCB M29 high-performance catamaran. With new twin Mercury Verado R400s, the boat can reach speeds as high as 108 mph. I sat in the companion bucket seat while the driver stretched the boat’s legs in a straightaway on the lake, which lay dead calm, thankfully, during the sprint. A GPS was mounted on the dash in front of me. It hit 103 mph. The boat, as rigged, was $290,000, with a base of $240,000. “The owner wanted the most fuel-efficient 100-mph boat we could give him,” Chiaramonte says.